Whether there is the big city life or the amazing national parks: North America strikes with a mix of pulsating metropolises, undulating fields and offbeat oases. You have the famous Museum of Modern Art in New York, the iconic Golden Gate Bridge in San Francisco or the CN Tower in Toronto on the one hand. And you have the breathtaking Grand Canyon, the beautiful Yellowstone National Park and the amazing Denali National Park on the other hand. They are all popular landmarks and areas millions of people are visiting every year – for a reason! North America is the third largest continent and stretches from Central America to Canada. With lots of history, multicultural art, big theme parks and great film and music festivals you get the best out of the continent. But not just that – North America covers with its deserts and rainforests every climatic zone, which makes it so interesting in both vegetation and wildlife. But besides all that, one thing is for sure: North America will never get boring and certainly takes your breath away. Accommodation – North America is a little more expensive than for example Asia or Africa. For hostels you pay up to 20€/23$. Private rooms cost about 40€/45$. If you want to go camping, expect to pay 9-13€/10-15$ plus the entry fee. In national parks the prices are higher (17-26€/20-30$ + entry fee). Food – One thing for sure: In North America you will never starve! From cheap fast food chains to exquisite restaurants, the countries offer a wide range. For a good meal in a restaurant you usually pay around 22€/25$. Transportation – There are many possibilities to get around: from renting a car to local busses to Uber to trains and trams. Busses are very cheap. Make sure you have some coins in your pockets. For Uber you usually pay 4-23€/5-20$ to get around the city. 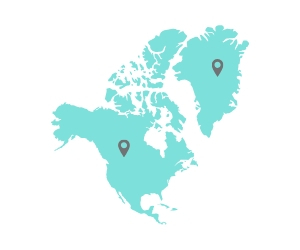 Use Uber North America has very widespread territories. For road trips a car is the most flexible and cheapest way when you can share fuel. For city trips Uber is the cheapest option. If you just want to get from A to Z, take a Greyhound bus. Book hostels weeks ahead If you don’t want to end up in expensive hotel rooms, plan your trip ahead and book hostel rooms in advance. North America is very popular. So there are plenty of backpackers who are also looking for cheap dorms. Look for discounts If you plan to visit some attractions and theme parks, have a look on Groupon. There you can make great deals instead of buying tickets online on the company’s website. So go ahead and save lots of money. Taxes are not included In most North American countries the taxes are not included in the tagged prices that you see in supermarkets or stores. So make sure to calculate the taxes on top of your purchase to avoid surprisingly high prices. First things first: visa requirements. There are some regulations when entering the countries in North America. For Mexico and the other Central American countries you don’t need a visa as a tourist. For the USA you have to apply for ESTA a few weeks before your trip. The fee costs about 14$ and is valid for two years. For Canada Commonwealth nationals, US, Cubans and EU nationals can enter without a visa. But you need to pre-register with eTA for a small fee before traveling. Otherwise you won’t be allowed on flights. It’s always good to have travel insurance while traveling – especially if you plan a longer trip with lots of adventures. So make sure you have one before visiting North America. The healthcare system is not designed for tourists. If you break your leg while skiing or crack your ankle while hiking, you end up paying a huge deposit (can be 500$) to receive medical attention. So just get coverage to enjoy your vacation – even with a little injury.